Crunchy Chicken Cutlets with Sesame and Pistachio Dukkah - A recipe from Savor California, the online showcase for extraordinary gourmet foods and beverages from California. Place the chicken in one layer inside a large resealable plastic freezer bag. Gently but firmly pound it with a meat mallet until it's about 1/4-inch thick, or even a bit thinner. Note: You may be able to buy thinly pounded chicken breasts from your butcher. Put the Dukkah in a wide shallow bowl. (You will need more than you think.) If you like, add a little bit of panko crumbs. Put the flour in a second bowl, and the beaten egg in a third bowl. Coat each piece of chicken first in flour, and shake off any excess. Then dip it in the eggs until it's coated. Then dredge it thoroughly in the bowl of Dukkah, pressing to make sure the Dukkah fully adheres, and shake off any excess. 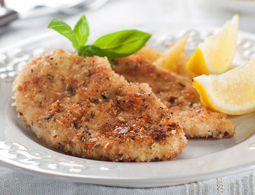 Place breaded cutlets on a plate or sheet pan. Repeat until all your cutlets are coated and ready to fry. You don't need a lot of oil to fry, just enough to generously coat the pan. Have more oil ready to add between batches, or if the pan starts looking too dry. Work in batches and make sure not to crowd the pan. Fry the cutlets until golden brown on both sides, 2 to 3 minutes per side. Add a fresh swirl of oil and repeat until all the cutlets are cooked to a golden-brown crisp. Transfer cooked cutlets to a paper towel–lined plate or a baking sheet fitted with a cooling rack until ready to serve. Or pop them in a low oven to keep them warm, if desired.